The oldest free public museum in the state, Orton is home to many exhibits that celebrate the prehistoric. From a 7-foot-tall giant sloth skeleton — the Megaloynx jeffersoni nicknamed Jeff — to collections of meteorites and mastodon teeth, there’s plenty for kids to marvel over. Dinosaurs, after all, are the “gateway to science,” according to Ausich. Dinosaurs get kids excited about science for the first time. In addition to education and research, Ausich and Gnidovec see outreach to the area’s youth as a vital function of the museum. Orton Geological Museum welcomes tens of thousands of visitors each year. Gnidovec gives dozens of talks throughout the year to children, college students, senior groups and museum patrons. The museum itself is frequented by a wide variety of groups across campus; biology majors, art students and paleontology fans alike visit to learn more about the history of Earth. When it came time to raise money for Cryolophosaurus, these preschool-aged fans (with the help of their parents) mobilized once again by dressing up as dinosaurs and selling cookies to raise awareness for the project on campus. “We bring kids to campus. We let them think, ‘Wow, I could be a part of this place someday,’” Ausich said. Gnidovec hopes that the addition of Cryolophosaurus will put the museum on the map and ignite future support for the museum’s educational mission. “What better way to get the museum noticed than with a dinosaur?” Gnidovec said. Orton partnered with Research Casting International (RCI), a Canadian company renowned for its dinosaur casts made for museum exhibits around the world. 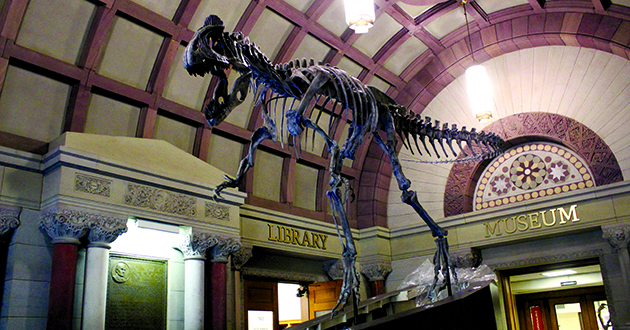 RCI made casts of Cryolophosaurus’ bones at its facility near Toronto before assembling and mounting the skeleton in the lobby of Orton Hall this fall. The team anticipates that the project will be complete just in time for Homecoming weekend. The next step of the planned renovation will incorporate technology into the museum’s exhibits, but it won’t attempt to replace the magic of being able to see and touch physical specimens.